Like the epic tales of heroic Spartan warriors and their nigh-impossible feats in battle, myth and reality collide in the Battle Cry Spartan Pocket Knife. An armor-clad ancient Spartan soldier emerges from the handle in breathtaking three-dimensional relief. The intricate motif is echoed on the handle’s reverse, finished in a vibrant, shimmering gold to offset the bleak-chic industrial gray of the obverse soldier relief. The multi-talented pocket knife also packs plenty of real-world cutting clout! It’s remarkably versatile and has serious muscle in the form of rugged aluminum handle construction, precision craftsmanship and a razor sharp stainless steel blade with a menacing profile and beefy, rock-solid build. The blade deploys in mere milliseconds, thanks to the velvety smooth assisted opening mechanism and the ambidextrous thumb studs and an integrated blade spur allow for easy one-handed opening. The blade includes a bit of unmistakable flair - a unique, sinister profile; finely etched crossed-arrow-and-shield accent; and a rustic stonewashed finish. Indeed, the Battle Cry Spartan Pocket Knife is like a Spartan soldier donned in the showy battle attire of ancient Greece. 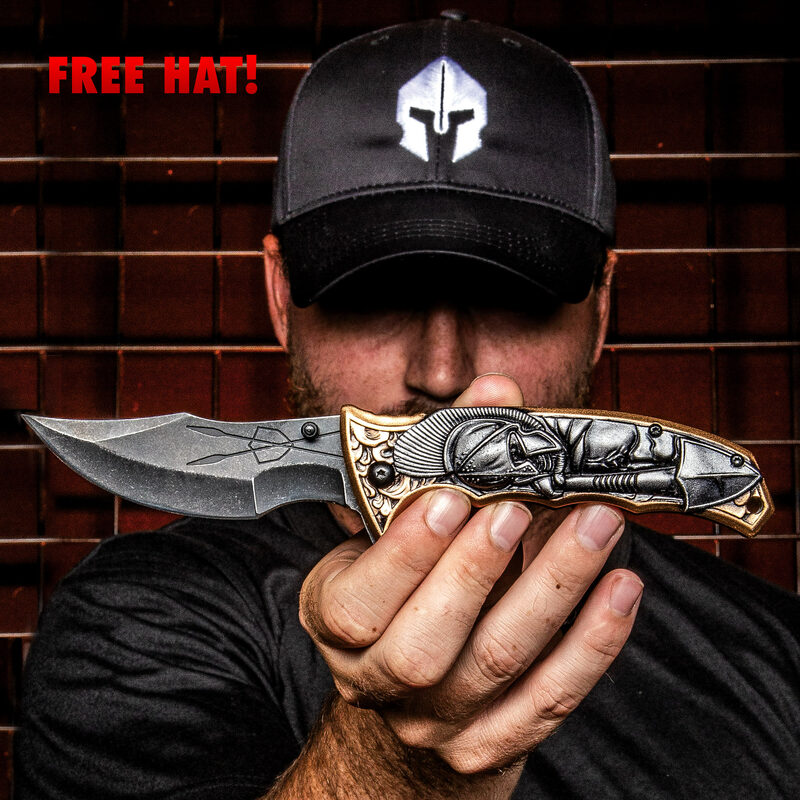 And there is no better complement to this pocket knife than our Spartan baseball-style cap! The black cotton twill hat comes absolutely FREE and features the iconic Spartan helmet embroidered in white. Looks and feels amazing but not sharp at all.